WILLEMSTAD - Digicel recently renewed their commitment with the Special Olympics Curaçao. This happens on all Digicel markets. The sponsorship is more than just a financial support. Digicel Curacao’s sponsorship goes along with a cooperation that supports the athletes during the entire year. Just to mention a few, the athletes receive special support to attend international championships, personal and social development activities as well as unconditional support from the company. It is known that founder of Digicel, Mr. Dennis O’Brien is a prominent supporter of the World Special Olympics Organization and Curaçao is not an exception. Digicel Curacao is more than happy to be contributing to the athletes of Special Olympics. This year the Special Olympics Summer Games are scheduled to be held on June 10 and 11 in South California. 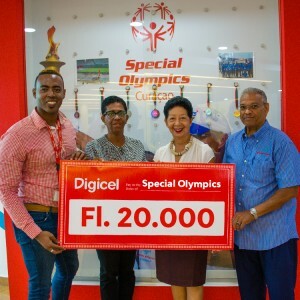 On picture Digicel, represented by Mr. Sharvelo Felomina, handed out the 20,000 florins cheque to the representatives of Special Olympics Curacao.